After the excitement of Tyson Fury’s battle with Deontay Wilder, which finished in a controversial draw, with many feeling that Wilder got the benefit of some appalling judging of the bout, the focus this week turns back to the Premier League and a rare midweek set of games coming up across Tuesday and Wednesday evenings. I’ve been averaging around 6 or 7 out of 10 correct in the Match Result market throughout the season so far, which means that we’re sitting on an above average return and I would like to think that one week, we could go through the card and land a maximum 10/10, which would of course result in a bumper payday (especially if you choose to back the games as an accumulator bet). So if you fancy trying your luck and want to sign up with a top ranking sports betting site then we recommend bet365 Sport. Not only do you have a great choice of different sporting events to bet on, but there is also the current bet365 Sport New Player Promotion, which sees new customers have the chance to earn up to £100 in bet credits. The games this week are split unevenly across Tuesday and Wednesday with four games on Tuesday followed by six on Wednesday and the biggest game of Matchday 15 is the clash at Old Trafford on Wednesday night as Manchester United will try to get back to winning ways as they take on Arsenal in what should be another Premier League cracker. The Gunners are flying and are unbeaten in 19 games since losing to Man City and Chelsea on the opening two weeks of the season. United, in contrast, have struggled to find form having picked up just two points from the nine available in the past three games and their home form in particular, has been very poor. It should be a cracking game and there are lots of other big games across both evenings, including the top three Manchester City, Liverpool and Chelsea facing away trips to Watford, Burnley and Wolves respectively, while Tottenham face Southampton at home on Wednesday. There’ll also be plenty of interest at Craven Cottage where Claudio Ranieri pits his new team against the Leicester City team he took to the Premier League title back in 2016. Outlined below are the results of Matchday 14, together with the latest league table and goalscorer charts, before we bring you our tips for the games in midweek. 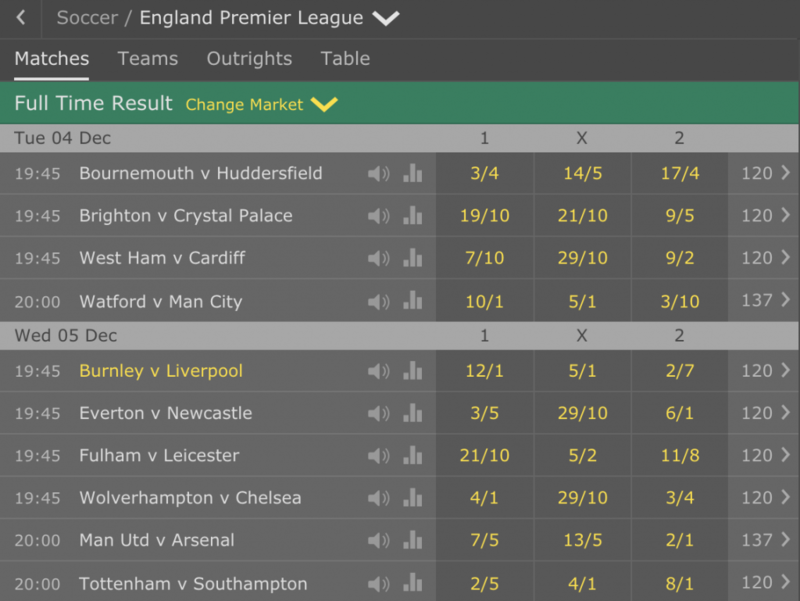 Here’s the latest odds from bet365 on the ten games taking place on Tuesday and Wednesday this week in the Premier League. Huddersfield were unlucky to see Steve Mounie sent off at the weekend, a decision which really cost them any chance of victory against Brighton. Bournemouth have lost all of their last four but I think they will relish the chance against a lower table opponent at home and I can see Eddie Howe’s men picking up what would be a welcome three points on the night. This game is a heated rivalry and as such will be fought out in a cauldron atmosphere at the AMEX Stadium. Brighton’s home form is good but I think Palace are starting to take more of the many chances they are creating and I think they will eventually pull clear of the drop zone as a result. I can’t see Roy Hodgson’s men picking up all three points here, but I am backing them to claim a solid score draw. After a fine display of counter-attacking football at Newcastle at the weekend, West Ham come into this game on the back of a 3-0 win and with some decent recent form behind them. Cardiff also won at the weekend but their wins have all tended to come at home and their away form is very poor, as such I am confident that West Ham will claim a victory in front of their own fans. Manchester City are just sweeping away teams with ease at the moment and though Bournemouth game them a few problems at the weekend, City prevailed to win 3-1 and retain top spot in the table. I can’t see a Watford team that is struggling for form and consistency at the moment having enough to upset this City team and as such, I think that the visitors are a good bet to secure the win. Liverpool were extremely fortunate to pick up three points in their win over Everton at the weekend, when Jordan Pickford’s fumble and the cross bar contrived to hand Divock Origi a simple tap in header. The Reds will need to play markedly better in attack against Burnley, although Burnley’s recent form is poor and manager Sean Dyche has said his side seem to have lost a little of the spirit they showed last season. That said, I am backing the visitors to win this one. Everton were very unfortunate to lose the Merseyside derby to a last gasp Divock Origi header at the weekend, but I think they will enjoy the fact that they can put that behind them quickly with a home game against a Newcastle team that they have a very good recent record against. Newcastle were well beaten by the Hammers at the weekend and this promises to be a tough afternoon on a return to Merseyside for ex-Liverpool boss Rafa Benitez. This will be an emotional game for Claudio Ranieri as he welcomes the team he took to the Premier League title in 2016 to Craven Cottage. However, the Italian cannot afford to be sentimental as his team are at the bottom of the table and in desperate need of points. Leicester are starting to look strong again and I can’t see the Foxes losing here, but Fulham are quickly improving under Ranieri and I think they will do enough to claim a point. This is a tricky fixture for Chelsea on the back of their home win over another newly promoted side in Fulham. Wolves have picked up points against Everton, Man City, Man Utd and Arsenal so far this season but their recent form is very poor, with just one point from the last 18 taken. That should help Chelsea secure another win as they try to keep on the tails of Liverpool and Manchester City at the top of the table. The Gunners don’t have the best record against Manchester United, especially at Old Trafford, but I think this fixture could well see a rare win for the visitors. 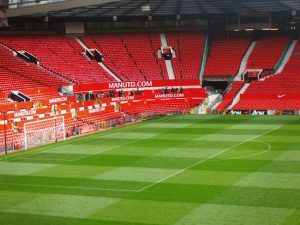 It is clear that there is something not right at Old Trafford at the moment and their home performances in particular are a real worry. With many top players, such as Sanchez, Lukaku and Pogba out of sorts, injured or out of favour, and with a defence cobbled together due to many injuries, I think United will struggle to contain Arsenal’s pacy attack. Spurs will have been hugely disappointed at their second half display at Arsenal at the weekend and I am expecting a reaction from Mauricio Pochettino’s men. Southampton are not the greatest side with just one win so far this season and in truth, I cannot see any way that Mark Hughes team will get something from this game. This has an easy home win written all over it from my point of view.